A Minnesota club plays radio while railroading through the forests of the Lake Superior region. Most of us have multiple hobby interests and it’s always fun when we can combine them into a single event. Besides being an Amateur Radio operator, I’m lucky enough to be a locomotive engineer on the North Shore Scenic Railroad out of Duluth, Minnesota. We use VHF radios for railroad work, which would seem to limit opportunities to combine ham radio with railroads. Not true! Our railroad is part of the Midwest’s premier Lake Superior Railroad Museum.While volunteering at the railroad, I’ve been involved in several radio projects. Recently, several local amateurs helped to design and install a repeater system for the 30 mile rail route. The system is used by train crews to communicate with each other as well as train dispatchers. In 2011, I became curious as to how an HF station might operate from a moving passenger train. Many ham operators design and test their equipment to operate in harsh emergency conditions. Those operating conditions are never the same and never predictable. Operating “railroad mobile” would be another opportunity to adapt HF gear to an environment that was certainly not designed with long range communications in mind. 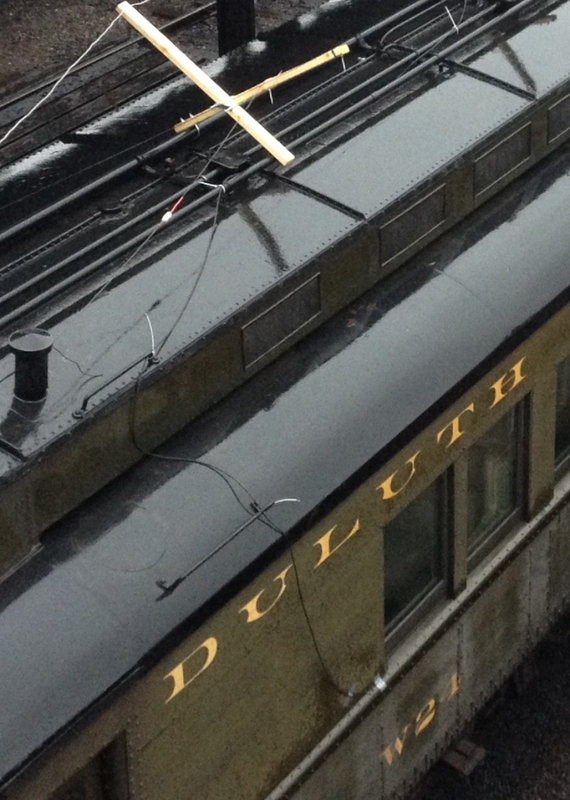 A modest test involved a simple 20 meter wire attached to some existing insulators on a rail car’s roof. A small group of operators made some good contacts and seeded the idea for a railroad mobile club. In 2012, a small group got together and created the North Shore Scenic Railroad Radio Club with call sign NSØSR. Our goal is to sponsor at least one mobile event each fall for an entire day, operating as a special event station. This gives us an opportunity to design and test new antennas while operating in a very temporary and restricting environment. Using backup power for multiple stations in close proximity was also required as only 34 V dc train line power is available. These 100 year old 34 V wires didn’t run through the entire train and power was only available when the engine was operating. The portable generator allowed us to position our stations wherever it was convenient and to keep them operating when the train was idle. On October 6, 2012, we operated from the old Duluth Missabe & Iron Range Railway Presidential Support Car W24. This early 20th century Pullman car has a large baggage area perfect for group gatherings. Large doors offer great views and fresh air. There is also a small seating area where operators can relax and soak in the “clickety-clack” of the ride as they enjoy a bygone era. Private state rooms were used for operating both 20 and 40 meter stations. These rooms allowed up to four operators to assist in radio traffic and logging while sitting in 1920s comfort. High back Pullman chairs and large windows transported them back to the era of elegant railroad travel. The rail car’s roof has three heavy-duty steel conduits welded along the length of the 85 foot car. These were installed when the 105 ton passenger car underwent renovations in the beginning of the 20th century to include such amenities as electric lighting. Our group used this conduit to attach an “X” bracing of 2 × 3 inch pine boards. Nine of the X braces were installed along the coach, allowing for both the 20 and 40 meter dipoles. Air choke baluns were placed on both ends of the coax runs, which were dropped down the side of the coach into the radio rooms. Due to height restrictions, our dipoles were limited to being no more than 3 feet off the roof. The total antenna height above the rail head was around 18 feet. Our stations consisted of Icom 7200 and 7000 transceivers, both running off large AGM batteries. A Honda generator was on hand for charging and powering the laptops used in logging and PSK operations. A pair of Dunestar filters were used for out of band rejection considering our antennas were only a couple of feet apart. The filters worked flawlessly and neither station experienced interference. Also on our train was a Soo Line Railway caboose in which we installed a CW station consisting of a Yaesu FT-817D transceiver driving a vertical antenna mounted to the roof grab irons. A second roof vertical was used for an Automatic Packet Reporting System (APRS) station. Antennas performed well with the exception of when we entered a tunnel. For that brief moment, the cell phone adage, “Can you hear me now?” applied. Our rail cars were attached to the morning train from Duluth to Two Harbors, Minnesota. This regularly scheduled tourist trip winds through the woods and along Lake Superior slowing for a few waterfalls and scenic locales. These provided great operating vistas for our purposes. We left Duluth for the morning excursion and operated for 2 hours during the ride northeast along Lake Superior to Two Harbors. At Two Harbors, we took a lunch break while the excursion train stopped for the passengers to explore the area. After a 2 hour stop at Two Harbors, it was all aboard and another 2 hours of operating as we traveled back to Duluth. The evening trip saw us switched onto the local tourist dinner train for another trip up the shore and back. We called our favorite pizzeria and placed an order. We stopped the train next to the eatery and picked up our food for the evening. Not too many amateur field operations can say they’ve done that! Eighteen local hams operated over the several hours we were moving. It was great fun explaining to contacts that we were on a moving train. Many contacts mentioned having relatives either working for or retired from various railroads all over the country. We made just under 200 contacts with people from coast to coast as well as Canada, Mexico, and Cuba. Most had never made contact with a railroad mobile HF station. Some were skeptical until they heard the locomotive horn in the background or verified our moving APRS signal. We are very lucky to have supportive staff at the railroad. It also helps that the general manager has been involved in radio himself for decades. For local hams, our relationship with the museum is a great combination of being able to help out the museum with technical radio work as well as further the HF side of our hobby. It also gives us practice in using the space and conditions given to make an HF station work. Any time that we can practice our abilities to operate in unfamiliar environments we prepare ourselves for unknown situations in the future. Whether those are emergencies or a weekend operating session, they are all good preparation. Information about our 2014 outings and photos of past events can be found at our QRZ.com page under the NSØSR call. We will announce the dates for our events on that page as well as at the eham.com, QST and CQ websites. Scott Parker, KDØHRM, became involved with Amateur Radio in 2009 and enjoys digital HF as well as HF manpack operating with an old military PRC-104B.